﻿﻿Endangered and native species thrive at ranches honored with top land steward award. ﻿﻿They are 90 miles apart and in different ecological regions of the state, but the two ranches have one very important thing in common — both are owned by a couple who have worked hard to rejuvenate their land. The Buckhollow Ranch in Uvalde and Real counties on the Edwards Plateau and the Stockard-Sirianni Ranch on the South Texas plains of Frio County belong to the family of Jack and Jan Cato of Houston. In the spring, the couple won the 2013 Leopold Conservation Award, Texas’ highest honor for private land conservation, in recognition of the conservation measures they have taken to improve their two special pieces of Texas. Given in honor of storied conservationist Aldo Leopold, the award is conferred each year by the Sand County Foundation, an international nonprofit organization devoted to private land conservation, in partnership with the Texas Parks and Wildlife Department as part of its Lone Star Land Steward Awards program. In Texas, the Leopold award is sponsored by the Lynde and Harry Bradley Fund for the Environ­ment, Silver Eagle Distributors and the Lee and Ramona Bass Foundation. In 2004, the Catos received a regional land steward award for their accomplishments on the 6,000-acre Buckhollow Ranch. Two years later, they were singled out for a second award for what they have done with the Stockard-Sirianni Ranch, which covers 2,900 acres. The Catos accepted the crystal Leopold award and a check for $10,000 at the annual Lone Star Land Steward Awards dinner in Austin on May 21. The couple inherited an interest in the Frio County property from Jan’s father 35 years ago and have owned the Buck­hollow Ranch since 1997. The Stockard-Sirianni Ranch is held by a family limited partnership. Even so, the Catos became the driving force in ramping up conservation efforts. 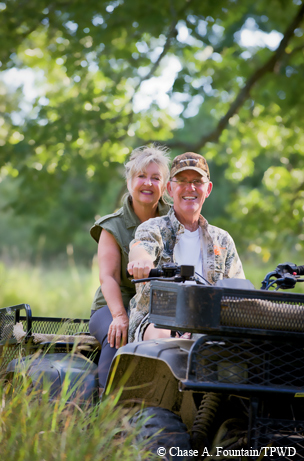 ﻿Land steward award winners Jan and Jack Cato take a ride in the pecan bottom of their Buckhollow Ranch. “We thought, ‘What can we do to make it enjoyable for everyone, mainly us and wildlife?’ ” Jack Cato says. Born in Galveston and raised near Hermann Park in Houston, he traces his love of the outdoors to his early teenage years, when an uncle often took him fishing and hunting on a 50-acre tract near Rosharon, south of Houston. After graduating from the University of Texas with a degree in history, Cato got drafted and served in the military for 20 months. Not long after that, working in downtown Houston, Cato met his future wife. A mutual love for crossword puzzles, coffee, the outdoors and wildlife led to a relationship and later marriage. Proving that a college major is not necessarily the predictor of someone’s future career, Cato became an oil and gas landman, acquiring leases for exploration and drilling. He later expanded into real estate and other aspects of the petroleum business. Over time, Cato rekindled his interest in wildlife and developed a passion for wildlife viewing and birding. ﻿Rolling hills dot the landscape at the Buckhollow Ranch north of Uvalde. In the early 1990s, the Catos began looking for ranchland. Over a seven-year period, their real estate agent showed them numerous properties all over the Hill Country and South Texas before they finally settled on Buckhollow Ranch. They wanted a place with water on it (Jan wanted something that reminded her of childhood time spent at Camp Mystic in Kerr County), and preferred the Edwards Plateau to the more arid ranch country farther south toward the border. Though Cato says he’s never had an abstract of title prepared for the property, he believes it has had only four or five owners since it was first established in the 19th century. Part of the Buckhollow used to be owned by the flamboyant Houston oil tycoon Glenn McCarthy along with several other Houston oilmen who wanted a Hill Country getaway. A later owner, the individual from whom the Catos purchased the ranch, raised cattle on the place, as had all the previous owners other than the oilmen. The Buckhollow overlooks the Dry Frio River and has wildlife ranging from the Guadalupe soft-shell turtle to numerous bird species to axis deer and native whitetails. “The ranch is well-watered in the Frio canyon, and the place never looks bad, with no animals beating it down and overgrazing it,” Cato says. Located just west of Garner State Park, Buckhollow features a main ranch house and several other structures built on a for-hire basis by the same Depression-era Civilian Conservation Corps workers who constructed the facilities at Garner. That involves managing the land to improve wildlife diversity and to provide optimum habitat for that wide range of creatures. The Stockard-Sirianni Ranch is in the South Texas plains. On that ranch, which is owned and operated by multiple heirs, the manager uses cattle as a wildlife management tool. 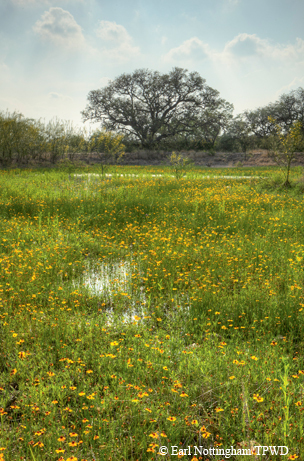 Stocked conservatively, the ranch is managed for maximum diversity of South Texas wildlife. One thing Cato says he learned in studying history is that people make the same mistakes over and over again, and that’s particularly true when it comes to the land. ■ Because of excellent habitat management, endangered species such as the black-capped vireo, golden-cheeked warbler and Tobusch fishhook cactus are increasing on the Buckhollow Ranch. 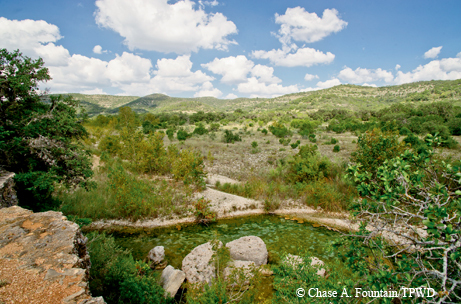 Natural springs are returning to life, and flow volumes have increased since the Catos purchased the ranch. Because of the ample ground cover that has become established through sound management practices, water penetration has improved, runoff has slowed, and soil erosion has noticeably diminished. ■ Native plant populations have been surveyed on Buckhollow by the Texas Nature Conservancy and monitored by various agencies including TPWD and the U.S. Department of Agriculture’s Natural Resources Conservation Service. Texas snowbell, an endemic native plant, was reintroduced several years ago in an attempt to re-establish it in its historical range. ■ On the Stockard-Sirianni Ranch, twice-yearly helicopter surveys are conducted to assess populations of white-tailed deer, coyote, feral hog, javelina, turkey and quail. Incidental herpetological surveys have also been conducted by the landowners, TPWD and ranch visitors. Plant surveys targeting native grasses have been undertaken by South Texas Natives and TPWD. Bird populations are also monitored throughout the year by various bird watching groups and individuals, including the Catos, who are active birders. ■ The Catos have participated in a prescribed burn school and numerous wildlife seminars to better educate themselves on habitat management and environmental issues. Most of their knowledge has been directly applied to the landscape. ■ Water guzzlers (mechanical watering devices) installed throughout Buck­hollow Ranch continue to benefit wildlife by improving species distribution and decreasing dependence on natural springs, rivers and streams. ■ Extensive stands of ashe juniper have been removed to increase spring flow, and four solar-powered water wells have either been retrofitted or drilled. Water diversion berms have been created across all hillside roads to prevent soil erosion, and one small holding tank has been created to capture seasonal water for wildlife. This has helped reduce negative impacts to sensitive areas. ■ As a result of extensive habitat management on Buckhollow Ranch, native grasses such as little bluestem are returning at an increasing rate, slowly replacing the non-native King Ranch bluestem that previous owners planted. Browsing pressure on woody plants such as live oak has decreased dramatically, allowing ample regeneration. ■ At the Stockard-Sirianni Ranch, the Catos have replaced fences and instituted a rotational grazing system. This has benefited the native habitat and improved livestock production. In addition, a roughly 20-acre wetland has been established for resident and migratory waterfowl, complete with levees and pipelines to maintain water levels. More than 100 bird nesting boxes have been put up on the property, including bluebird boxes, screech owl boxes, wood duck boxes and purple martin houses. Bat boxes have also been installed. ■ Beyond the work they have done on their land, the Catos have been generous in sharing their properties with others — including local residents, neighbors, conservation groups, universities, and state and federal agencies. They have been actively involved with TPWD, NRCS, the Nature Conservancy, West Texas A&M University and Southwest Texas Junior College by allowing these agencies or institutions to use the ranches for meetings, field days, research projects, demonstrations and educational programs. Earlier this year, the Catos placed the Buckhollow Ranch under a perpetual conservation easement with the Nature Conservancy.